My daughter loves watermelon. I buy one each week and she eats almost all of it by herself. I certainly don’t mind because it so good for her and I will let her eat fresh fruit just about any time she wants. Now that she is back in gymnastics practice, we do end up with a little bit of watermelon leftover and I’ve been using it to make myself a watermelon mojito on the weekends. A mojito is one of my absolute favorite cocktails and I order pretty much anytime I find it on the menu at a restaurant. 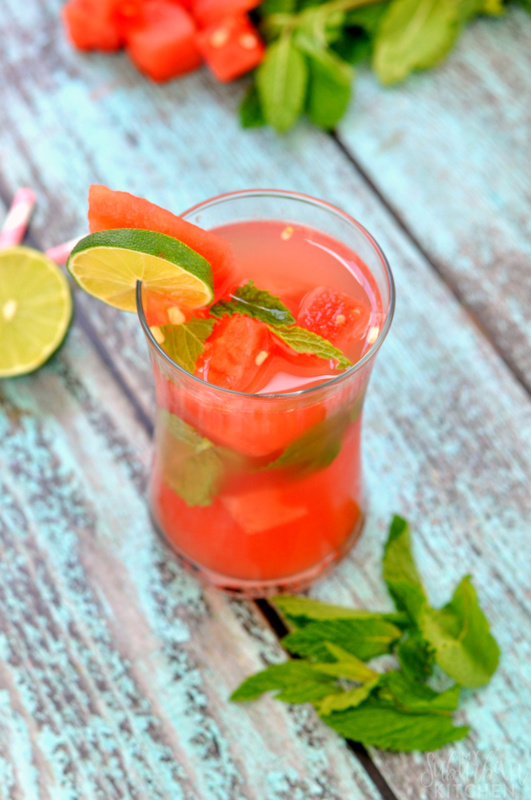 My favorite is an Italian raspberry mojito but I love adding watermelon for the summer. It just seems like the perfect combination on a warm, summer evening. Place watermelon pieces in food processor and puree. Strain through a sieve saving the liquid. Discard pulp. In the bottom of a cocktail shaker, muddle mint leaves, sugar and lime juice. Add in rum and 1 1/2 ounces watermelon juice. Stir well and pour into glass. Add ice and top off with a splash of soda water. 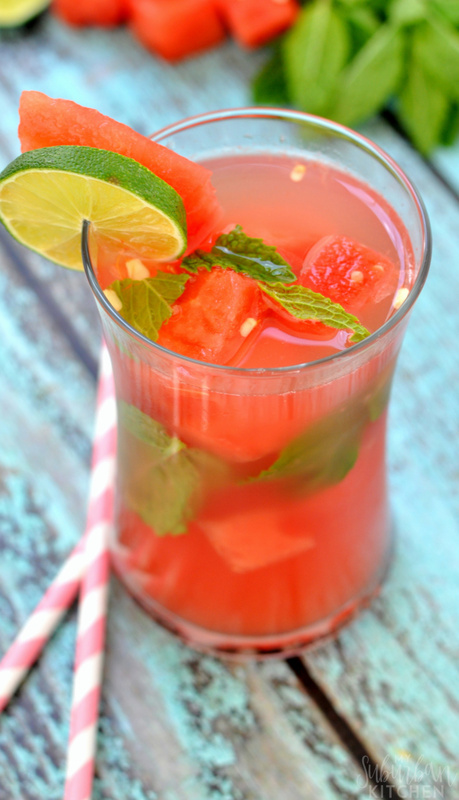 Garnish with watermelon pieces and extra mint. If you have any non-drinkers visiting, you could easily just replace the rum with soda water for a nice, fizzy watermelon drink. 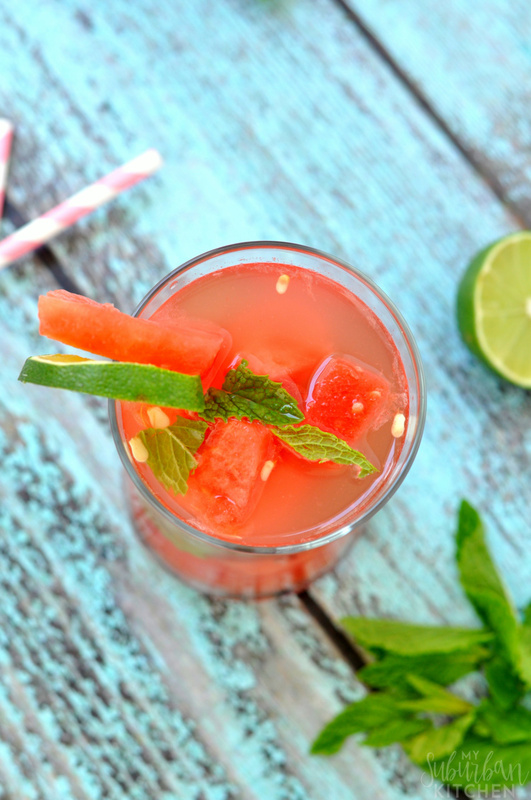 The watermelon and mint combo are what make this drink so delicious. The rum is just an added bonus! What are some of your favorite summer cocktails? 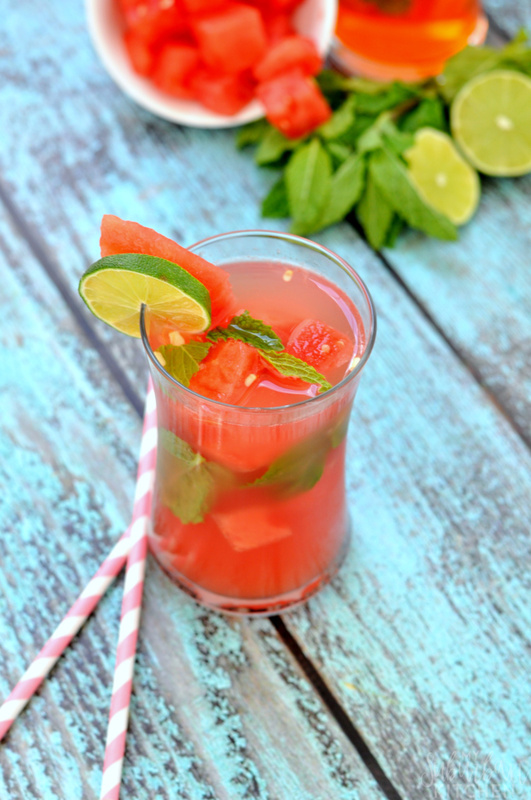 Do you like to incorporate summer fruits into your drinks? I’m suddenly very thirsty…I think I’ll have to go buy some watermelon tomorrow! Thanks so much for sharing your delicious recipe with us at Share The Wealth Sunday! My kids love watermelons too. They are so easy to cut up for a snack during the summer! Thanks for sharing at the Family Joy LInk Party! I cannot wait to have one (or two!!) of these! Gorgeous!! Thanks for sharing with us at Throwback Thursday!